We worked with the team at White River Services and Solutions to create a stunning, mobile-friendly, and responsive website. From the moment a visitor lands on the homepage, they are greeted with a clean layout, easy navigation, and an overall professional look. Services and solutions have dedicated pages and make finding information simple. The CONTACT page and the number at the top of each page also make it easy to reach out for help or get answers to questions. 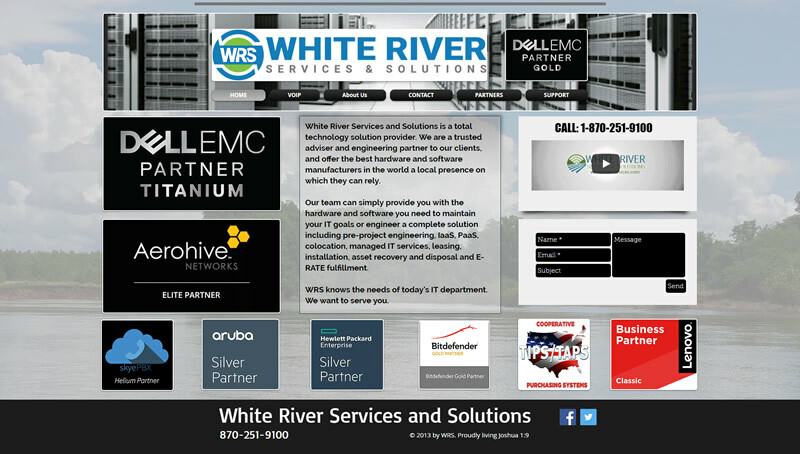 White River Services and Solutions is an Arkansas based technology company. They can provide you with a dependable and affordable place to acquire your IT, or they can completely configure, install, and manage the hardware and software you need to maintain your IT goals. Their managed services solutions include network infrastructure, DR, IaaS, VOIP, HIPAA, and security.